Following the ratification by Hawaii Government Employees Association members of a new two-year contract, Gov. Linda Lingle this week announced details of a plan that calls for two furlough days per month for the next 20 months for state employees. 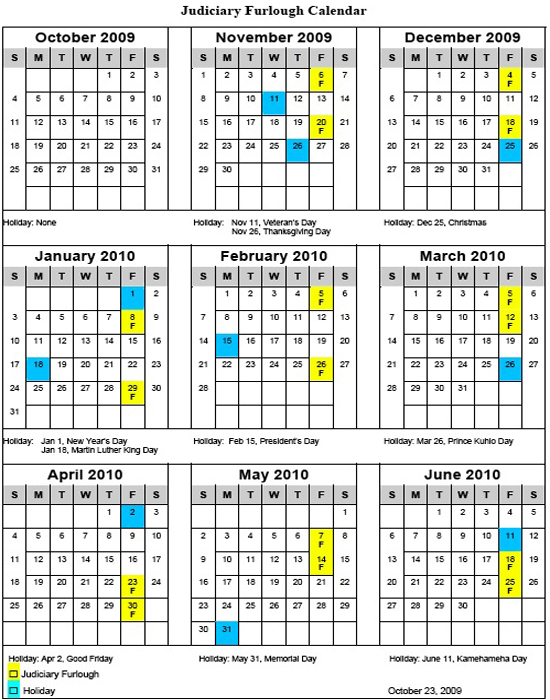 To minimize the impact on the public, most state offices will close all or portions of their operations on two specified Fridays per month. The Leiopapa A Kamehameha State Office Tower, like other state office buildings, will close two business days per month. Under the plan, in accordance with the new HGEA contract, full-time state employees under the governor’s jurisdiction will be placed on furlough for 18 days through June 30, 2010; and 24 days of furlough for fiscal year 2011, starting July 1, 2010 through June 30, 2011. Part-time employees will be placed on furlough on a pro-rated equivalent basis. The furlough plan applies to HGEA employees in the Executive Branch including 16 state departments and their attached agencies. In addition, the plan applies to non-union “exempt excluded” employees in the Executive Branch. Exempt excluded employees who have been taking three furlough days per month since Sept. 16, will now conform to two furlough days per month as reflected in the new HGEA contract. 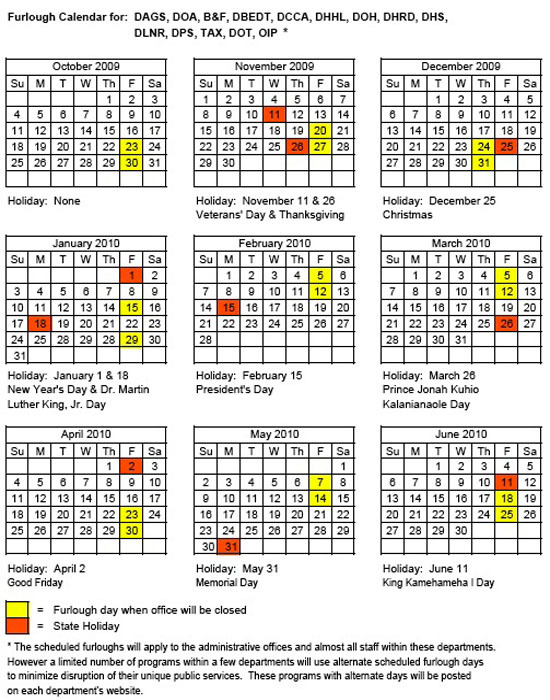 All courts and administrative operations of the Hawaii State Judiciary, with the exception of the Juvenile Detention facility, will be closed while employees are on furlough two days each month, effective November 2009. The Hawaii Supreme Court has ordered that, for purposes of calculating time, each furlough day be treated as a Saturday or Sunday. Therefore, a person who has a document due on a furlough day may file the document on the next business day. The Judiciary coordinated its furlough schedule with certain agencies, including the Department of Public Safety, as services such as security and transport of persons held in custody by deputy sheriffs are needed for court operations. The Department of Education’s furlough schedule was also considered to accommodate parent-employees. The Judiciary’s website offers users the option of transacting some types of court business online, thereby eliminating the need to go to a courthouse. Online users may pay fines and fees for traffic infractions, research case information, and obtain court forms.